Hi, folks. 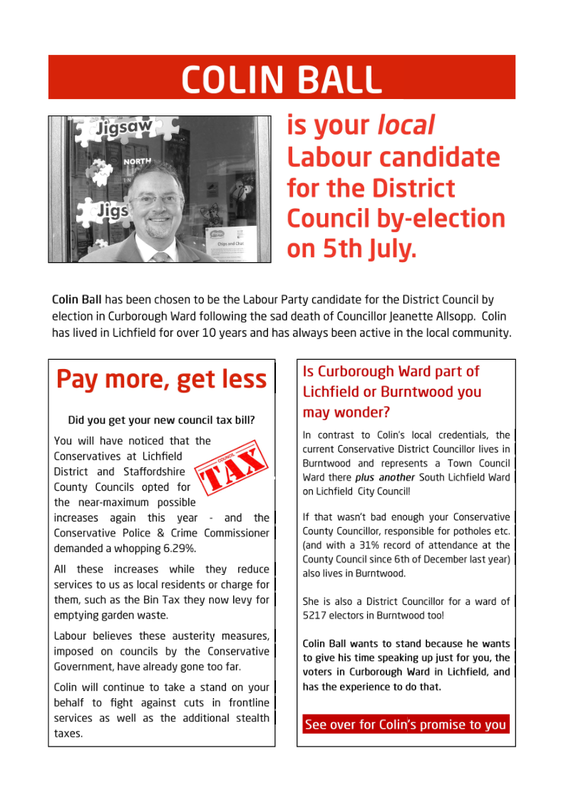 Just in case you haven’t heard yet, we won decisively in the Curborough By-Election yesterday. On a very low poll (15%), we had almost twice as many votes as the other two parties combined! 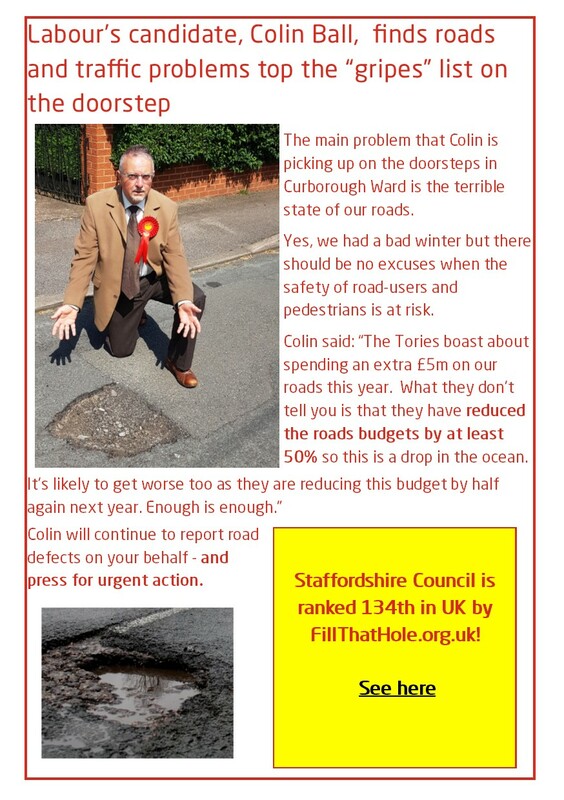 Not that this is all that surprising, looking back, as the Tories only put out one leaflet – and that was pretty much their 2015 leaflet recycled with the same old, tired ideas – and the LibDems didn’t put out a leaflet at all! We ran a great campaign. So a special thanks to Dave Robertson and also to Sue Woodward and Steve Norman for all their help and support. A big thank you too to the dozens of you who helped with leaflets and door knocking and donations. I’d like to thank everyone personally, but I’m not sure that I could find the time! However, great though it is to win, this is only the start. We have the full District and City Council Elections coming up next May. We need to build on our success yesterday and get as many Labour folk elected as we can. We also need to try to contest every seat, even those we don’t think we might win. That will stretch the Tories – and the LibDems – to the limit and give us more of a chance of racking up Labour gains. 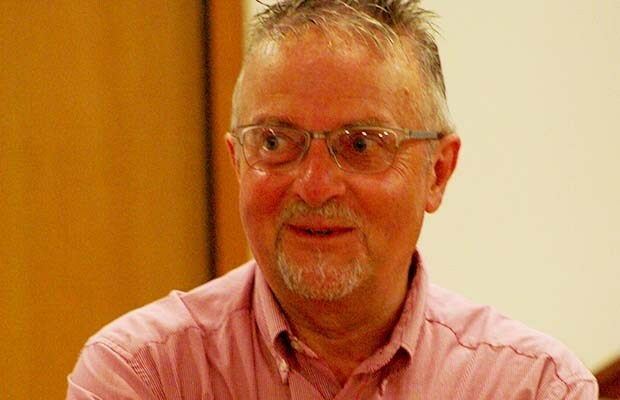 So, if you haven’t let Dave Robertson know yet, do, please, get in touch with him, to ask to be added to the list of possible candidates that he has begun to draw up. Let’s keep the red flag flying here! 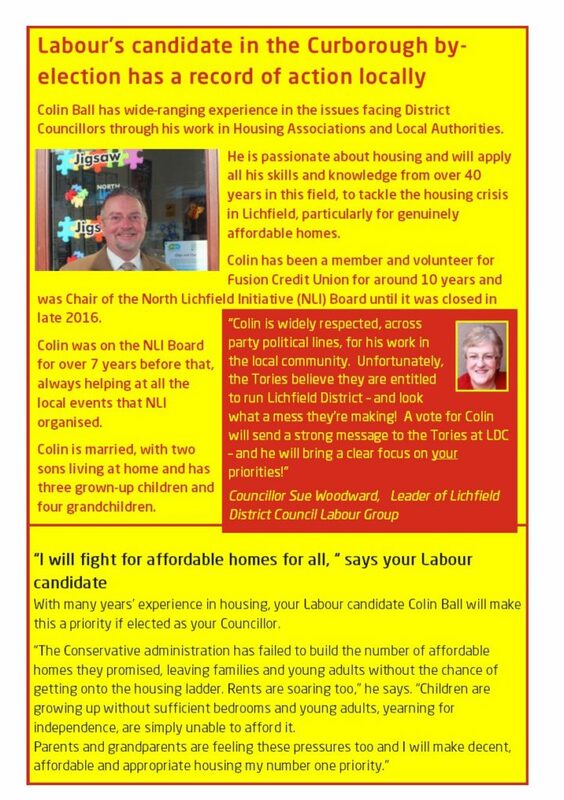 Colin Ball, proud Labour Party City and District Councillor for Curborough Ward! 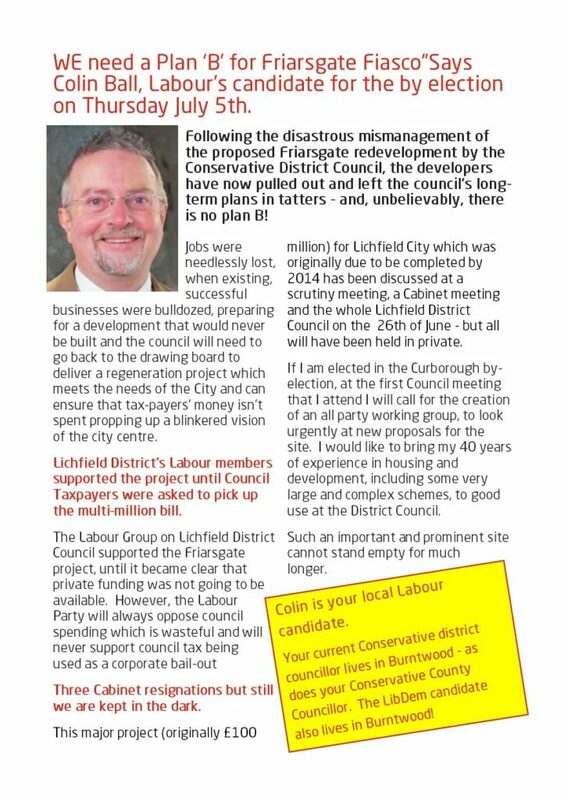 Curborough is the most winnable ward in Lichfield and with the ongoing bad feeling about the Friarsgate fiasco we have a real chance to turn back the tide at Lichfield District Council by electing another councillor. However, we do need to strike while the iron is hot and make sure that we do all we can to mobilise our voters and maximise our chances. If you can offer a couple of hours of your time, even if you’ve never been canvassing before, there’ll be many experienced members at each session and roles for everyone, even if you’re not as confident with door knocking. 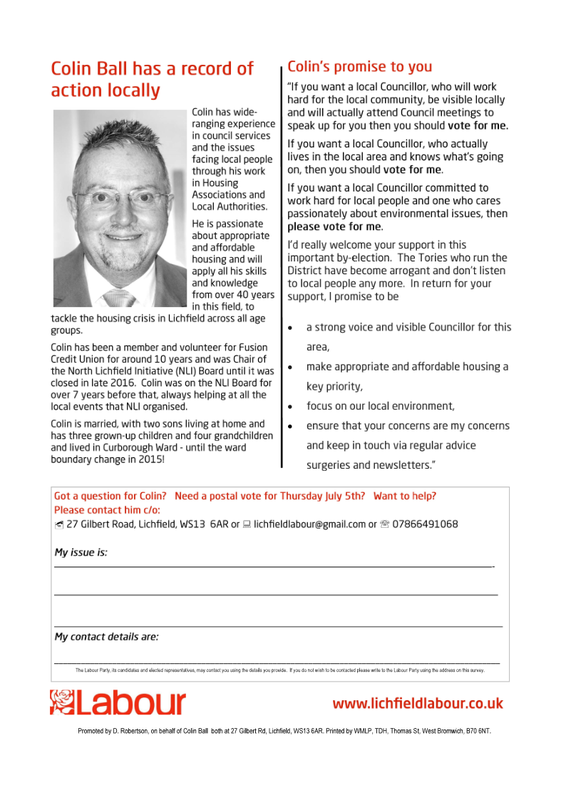 Promoted by D Robertson on behalf of Colin Ball both at 27 Gilbert Road, Lichfield, WS13 6AR.